Mar Elepaño was born in the Philippines in 1954. He left for Los Angeles to study film in 1975 at the University of Southern California. He finished his degree in Film Production and stayed on to become a staff member and later adjunct faculty. He has taught at the USC School of Cinematic Arts in the John C. Hench Division of Animation & Digital Arts from 1993 to 2007 and now serves as the production supervisor for the division. 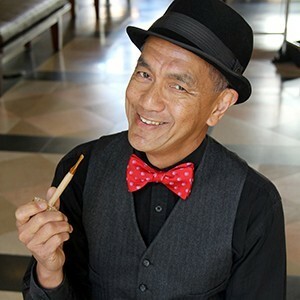 He has been involved with community arts programs in Los Angeles that help young people create personal time based narratives since 1986 with organizations like Visual Communications Inc., the Heart Project, the Los Angeles Educational Partnership, the Korean Resource Center, Khmer Girls in Action, the Asian American Drug Abuse Program. He was given the University of Southern California President’s Staff Achievement Award for 2009.